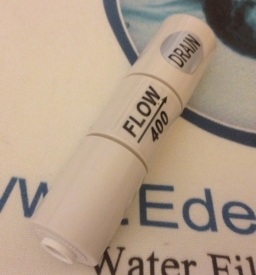 400 mL/min inline flow restrictor that goes on the drain/brine line from an RO Membrane. It has 1/4” Quick-Connect fititngs on both ends. If 400 mL/min Inline flow restrictor is used with a 50 GPD Reverse Osmosis membrane, then the ratio of brine to pure water is 3: 1. The inline restrictor is 7/8” dia and is 4” long.